Hoy Bus - still going strong! ORKNEY U3A accepts no responsibility for information given on links. Travel can be dynamic. Check before leaving. Summer timetables begin in May. This is a very comprehensive site. You can even check out your concessions! We are always pleased to make our mini-bus available to visiting groups who wish to explore the island, subject to availability. As our Afternoon Club largely shares the objectives and criteria of U3A, we would especially welcome any visiting U3A groups. Maximum passenger seating is 14 but I suggest that any number over 10 would be a bit 'tight'. Because of the terms of our funding and insurance, we cannot offer self-drive, but either May Allen or myself (our two charming drivers!) will always meet visitors off the ferry at Loth pier. Presently we charge 50 pence per mile to cover fuel and look for a donation to club funds of around £30 per half-day. Of course, for a visit to/from a single venue on Sanday, it would probably be cheaper for members to travel on the Sanday Bus, which also meets every ferry and will take passengers to any destination on Sanday. 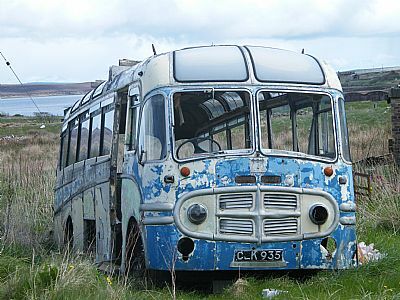 Concession Cards are accepted on the Sanday Bus. I hope this will be of interest to U3A members.